Daisy originated from the Old English meaning, dægesege, from dæges eage meaning “day’s eye” because the flower opens and closes based on sunlight exposure. Throughout history the Daisy has been associated with many goddesses, Freya and Ostara (Germanic) as well as the Greek goddess Aphrodite. The most notable story is from Roman Mythology and a nymph named Belides. She transformed into a daisy to escape from a Roman god. The latin name for the English Daisy, Bellis, originated from that story. During the Victorian era, maidens pining for a lost love would pluck a daisy’s petal one by one and chant, “he loves me, he loves me not,” for each petal removed. The last petal predicted the outcome. Maidens were also known to blindly pick a handful of daisies to determine when she would marry. Upon opening her eyes, the number of blossoms in her hand foretold the number of years remained until her wedding date. The daisy family, Compositae, was classified by a German Botanist, Paul Dietrich Giseke, in 1792. Daisies belong to one of the largest plant families in the world, vascular plants. They bloom all summer and will attract bees, birds and butterflies to your garden. You can find a daisy almost anywhere on earth, except Antartica. It’s 2 flowers in 1. 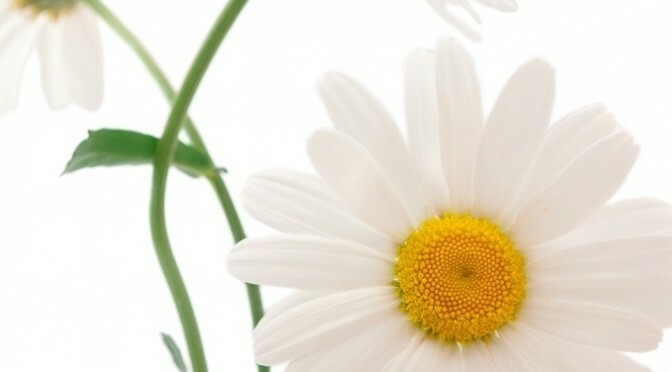 The white petals are considered a flower and the eye is made up of yellow petals making it a second flower. The leaves of many daisy genus (including Bellis, Gerbera and Leucanthemum) are edible and high in Vitamin C, making them a great addition to salads.